The smallest DMX controllable LED Fresnel on the market, the daylight-balanced Sola 4™ offers the controllability and light-shaping properties inherent in a Fresnel light at a small fraction of the power draw of conventional fixtures. Like the rest of Sola Series, Sola 4 provides Lite-panels’ famous soft light quality. 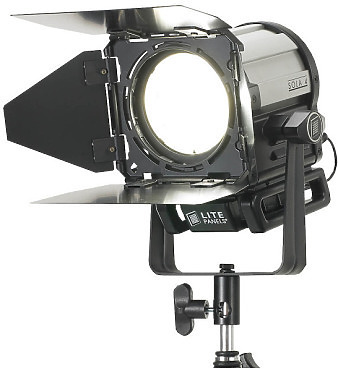 Hire the Litepanels Sola 4 Daylight Fresnel LED Light from Procam. Best service and rental rates for the Litepanels Sola 4 Daylight Fresnel LED Light and all cameras, lenses, sound, lighting and grip.